Hello all. I was at EGX2018 (The UK’s biggest games expo) on Friday and witnessed this occupying at least eight PS4 Pros in a row; thought you’d be interested. In short, if you’re there for a day or two, you couldn’t take everything in. You’ve got to have priorities. There’s a PS4 release coming soonish that I’m more than excited for, called Dreams. If you’re not aware of it, it’s the next ‘LittleBigPlanet’, a tool for creating your own PlayStation games first and foremost, in a very well-polished UI, to share with any other Dreams players. Complete with a campaign that the developers have built entirely with their own engine, using DualShock controllers instead of mice and keyboards and traditional tools. 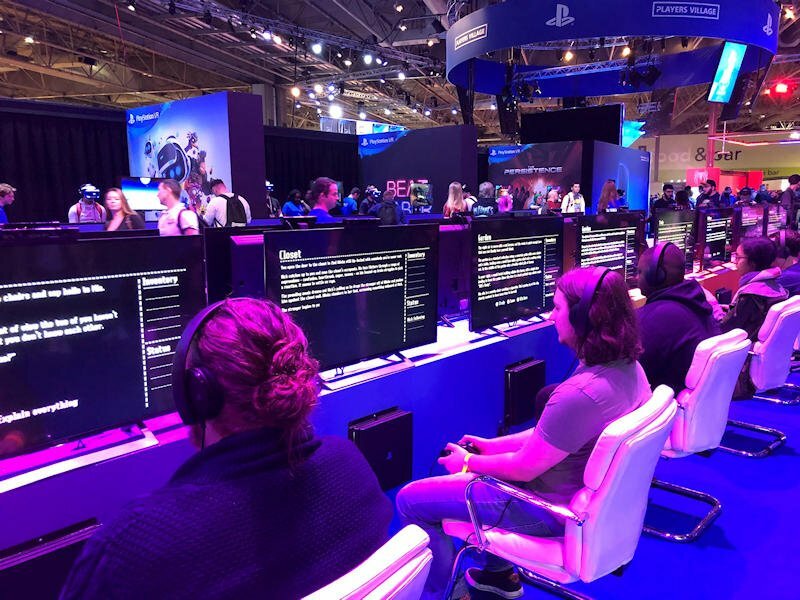 The Dreams stand at EGX had twenty PS4s set up for players to try one campaign level or any one of seven very different mini-games that the studio had come up with in their free moments, so even within that stand there were competing attractions. Yes, by its nature, it was going to see longer average playtimes than the other demos. But still a remarkable showing that I thought you might like to see. Curiouser and curiouser! Thanks for the report. It’s hard to wrap my head around in the same way little big planet was when it came out - now with game/tool crossovers like Mario Maker, this will be interesting to see. I can only imagine it as a less complex non-social Second Life - in that you could be exploring an environment one minute, then throwing out primitives and creating a place to sit the next. I’ve been following the development of this game very closely for a long time so happy to field any Qs, if people are curious. Fundamentally, it’s a creativity tool that has strengths in creating 3D shapes, particularly (if desirable) in a painterly style, in music and sound manipulation and recording performance with a PlayStation controller as part of the way you create content. In reducing the UI for all of this - and the interlinking object-oriented ‘code’ (like wiring gadgets and logic gates together) - to something that can be achieved comfortably and easily with the standard controllers, it’s probably this UI polish that seems most impressive to me. The UI allows creators to switch between editing and playing really seamlessly - you don’t go off into a separate screen to compose music or design a character, you seem to do it there and then in the level, following which you jump straight into play mode to test your changes. Once you’re happy, you publish a level, just like LBP, and there will be plenty of people who just want to experience it (play, listen, explore, watch - depending on what you’ve made). Dreams allows users to ‘surf’ through random levels, as well as search through published objects to find inspiration for their own creations. The whole social side is yet to be properly unveiled but without online play at launch, that remains uncertain. I certainly don’t think it will be a particularly good way to create an interactive text-based experience (though I’ve not seen the text gadget, I can’t imagine it’s as usable as even a half-decent forum message entry box - I may be wrong - and my PS4 set up is not ideal for keyboard work). But there is plenty of potential for really bespoke visual novel stuff here, and for creators to make tools that will help other people make their own visual novels, if that’s of interest. All using just a PS4. If anything, the fact that someone made an all-text game bodes well that one might make a credible graphic adventure with plot elements in Dream. This is on my radar now, it sounds at least as fun to experiment with as LBP. You might also be interested to hear then that, as with LBP, Media Molecule will include a main campaign in the game, to inspire creators. That campaign is split into three separate stories in three very different styles. Two are 3D platformers; the third is a graphic adventure, supposedly using just a pointer to interact with the environment and guide your character around. There’s definitely a lot of scope for something more SCUMMy in there. My worry though would be how much data could be saved at the behest of the creator. We’ve been shown that some information can be carried from one level to the next during play, but I’ve seen little information to suggest anything could be saved and restored at a later date. The ability to build and play in VR is also going to be exciting. And with the ability to sculpt and paint any shape you want, it’s likely a whole lot more fun than LBP for messing around in.